The IR beamline has two 60 cm multipass cells; one for exotic or reactive species and one for standard or non-reactive samples. Light is passed through the sample multiple times in the cell, increasing the path length of the source and thus increasing the sensitivity of the system (Beer’s Law). The last imageshows the mirror in the base of the glass cell for non-reactive species. The number of spots indicates the number of times the beam is bounced through the cell. 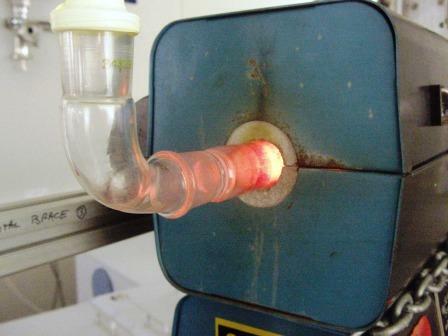 The glass cell for exotic or reactive species can be coupled to a furnace capable of reaching temperatures <1100 °C. Please indicate to IR beamline staff if you wish to use the furnace. 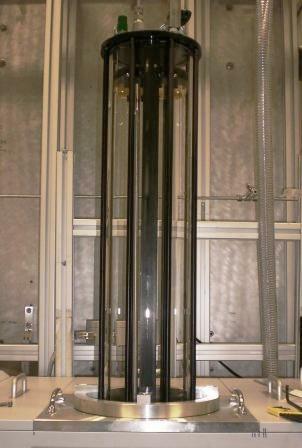 60 cm Multipass Glass Cell for reactive species. The cell has three inlet/outlet ports. The cell can be attached to a ventilation exhaust system. The cell is shown wrapped in heating-tape; the cell can be heated to temperatures of 80 °C. 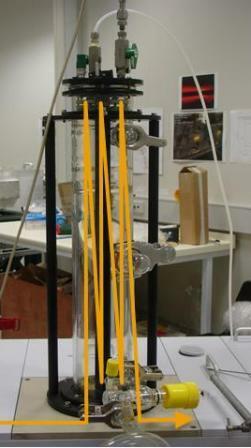 60 cm Multipass Glass Cell for non-reactive species. The beam can be bounced through these cells multiple times; max. path length approx. 20 m. The bottom mirror of the 60 cm cell for non-reactive species. The number of spots indicates the number of times the beam is bounced through the cell. 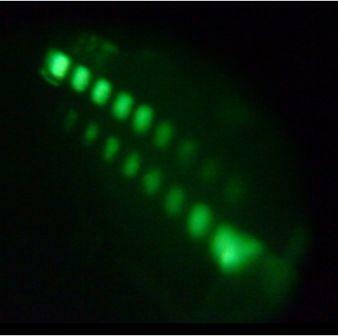 Spots were visualised using a near-IR viewer. 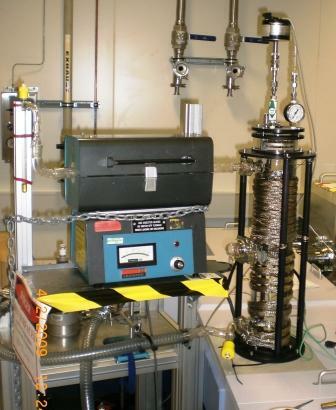 The IR Furnace; can reach temperatures of < 1100 °C. Please indicate to IR beamline staff if you wish to use this equipment. 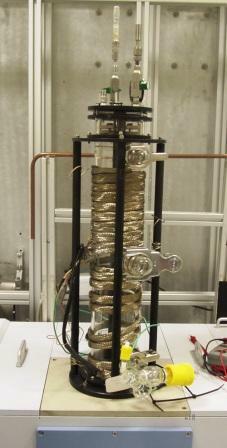 Showing the furnace coupled to the multipass cell for reactive species. The sample gas is passed through the furnace and into the multipass cell for analysis. We have an Enclosive Flow Cooling (EFC) cell with a base OPL of 625 mm, this cell can reach liquid nitrogen or liquid helium temperatures and is used for the study of gases, particulates and/or cluster species. The cell can operate in two modes: flow-through or static mode. The cell is currently being commissioned but can be used in the static mode. Please ask IR beamline scientists with regards to flow-through experiments. Transport and use of gas phase samples at the Australian Synchrotron is at the discretion of OHSE approval (see your Experiment Authorisation form: submit appropriate Risk Assessments and MSDSs). Small gas cylinders may be brought onsite by the user but they must be OHSE approved by your place of work for use and transport (appropriate date stamps must be present). You must supply your own gas regulator. Fittings must be 6 mm or ¼” Swagelock. Please provide IR Beamline staff with details of the sample including cylinder volume.